George of the Jungle Owie Owie : George of the Jungle is back and he needs your help! Owie Owie fever has turned once friendly and collectible light bugs into a bloodthirsty army. Climb as high as you can, making sure that you watch out for that tree (and that rock, and those thorns, and that bat). How high can you get? 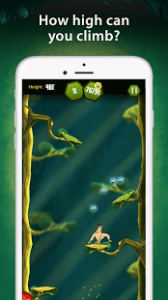 4 separate worlds: Jungle, Waterfall, Thicket and a *gasp* mystery level! Awesome ragdoll action. Watch George smash into everything when he falls! Slo-mo! Watch bonecrushing hits in super slow motion at the touch of a button. Share your fails and best scores with your friends and challenge them! Time of day play! Try playing at night for a tougher challenge… and greater rewards! Achievements! Over 30 of them! Costumes! Dress George up as a Grandma! Seriously! Friends! Find Shep, Ape, Magnolia and even Tookie-Tookie to get their unique powers! Make sure to check out all of George’s adventures in the new George of the Jungle cartoon coming Fall 2016! Check your local listings. Addictive and challenging Got quickly hooked to this game because of the gameplay mechanics. Fun and super satisfying once you get the hang of it.